Due to recent freezing spell a pipe burst in the attic of a local hotel damaging the two levels below. Upon arrival there was several inches of water in the downstairs conference room. SERVPRO of Nixa & Branson crew members worked quickly and efficiently to extract the water and remove all the affected wet ceiling tiles and other material affected, this enabled us to dry the ceilings and walls. 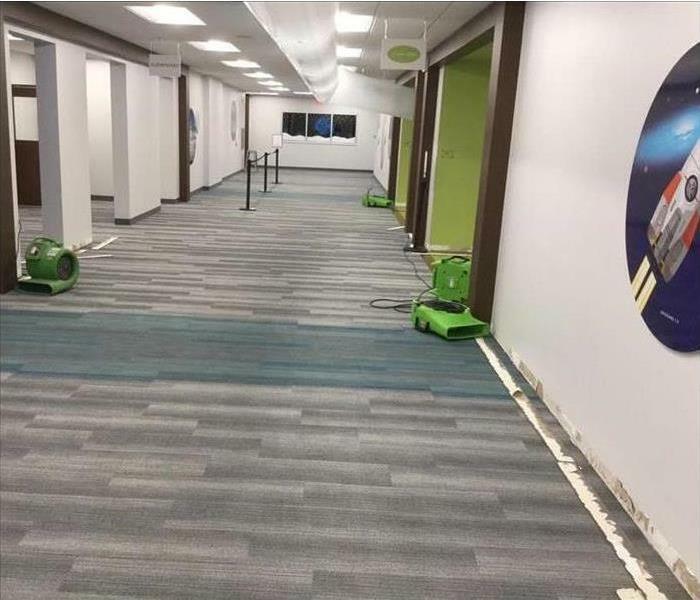 Our crews worked throughout the night and were able to get the building dry and we were able to save the carpet in the large conference room of the hotel. 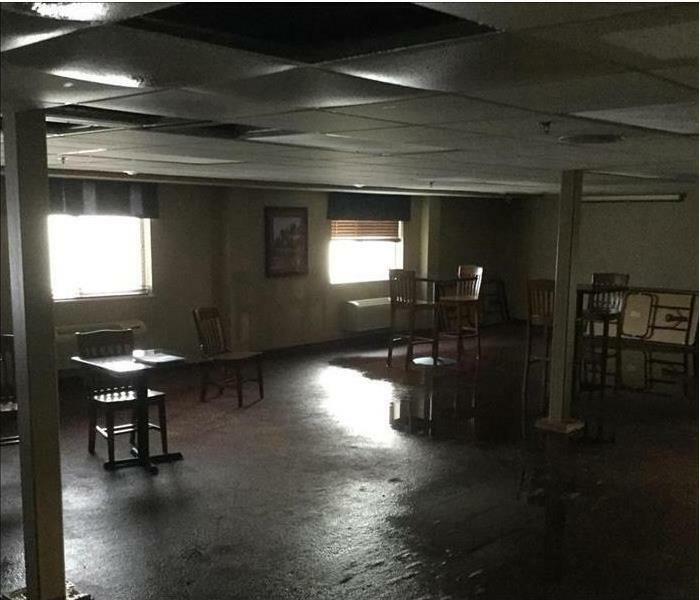 If you have a commercial water damage or would like to get a free Emergency Response Plan into place for your business call us at 417-724-0084. Strong musty odor which may indicate mold is present. 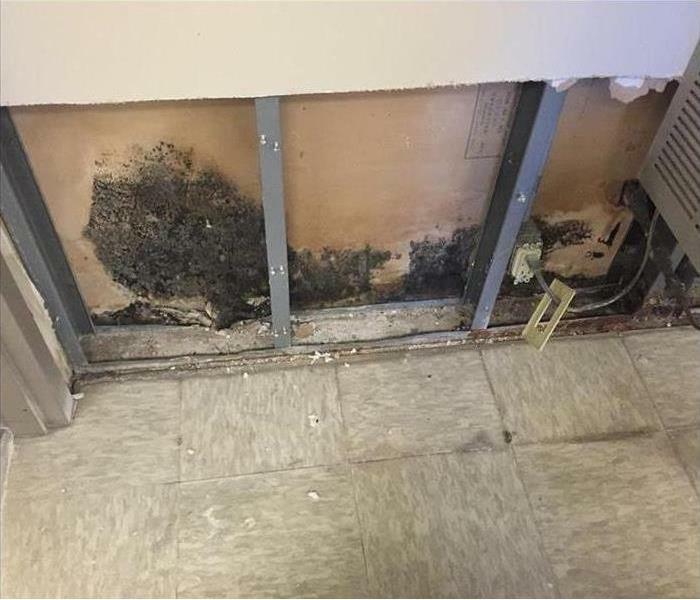 Any evidence of past moisture problems that have caused undetected mold growth. We recently completed an extensive mold remediation in a kitchen in a Southwest Missouri home. 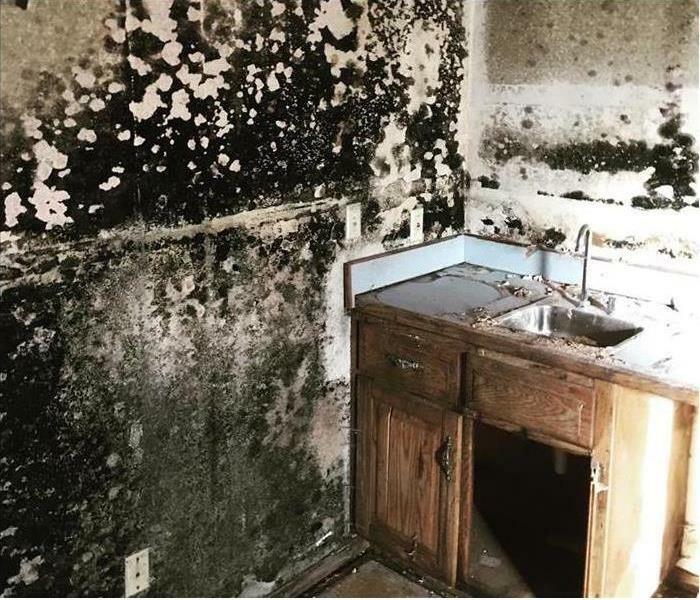 The mold was caused simply by a leaky faucet. The photo shown is during the cleaning process. SERVPRO of Nixa/Branson's professionally certified crews use containment while cleaning to keep the mold spores from spreading through out the home. This is done by using air scrubbers to capture the spores in the work area and pulling the air outside while work is being performed. Due to the amount of mold the kitchen had to be completely demoed down to the stud framing. This allows us to dry the structure and remove, clean and disinfect the mold. This demonstrates how something as simple as a leaky faucet can cause damage to your home. SERVPRO of Nixa / Branson has the knowledge and equipment to eliminate the diverse and pungent odors that occur after a fire. Besides the easily accessible areas, we also examine wall cavities, duct work, crawl spaces and plumbing chases to establish whether they also suffered any smoke or fire damage. We’ll ensure that they’re cleaned, repaired and that all traces of odor are removed. So as tempting as it may be to rush back into your fire damaged home or business once the fire is out, play it safe and call SERVPRO of Nixa/Branson first so that we can safely make it “Like it never even happened." During a recent cold snap a frozen pipe caused this southwest Missouri church to flood. This picture shows a portion of the building during the drying process. The cove trim was removed to allow us to access the area behind the walls. We utilized a large desiccant dehumidifier to dry the entire building. The desiccant recycles the air inside, bringing warm dry air inside while sucking moist air outside. SERVPRO of Nixa/Branson's efforts resulted in having 90% of the building dry within 3 days. Water damage can strike your commercial property at any time. Water damage can sideline your business, regardless if the damage occurs from a major storm event or a broken water line. Every hour spent cleaning up is an hour of lost revenue and productivity. 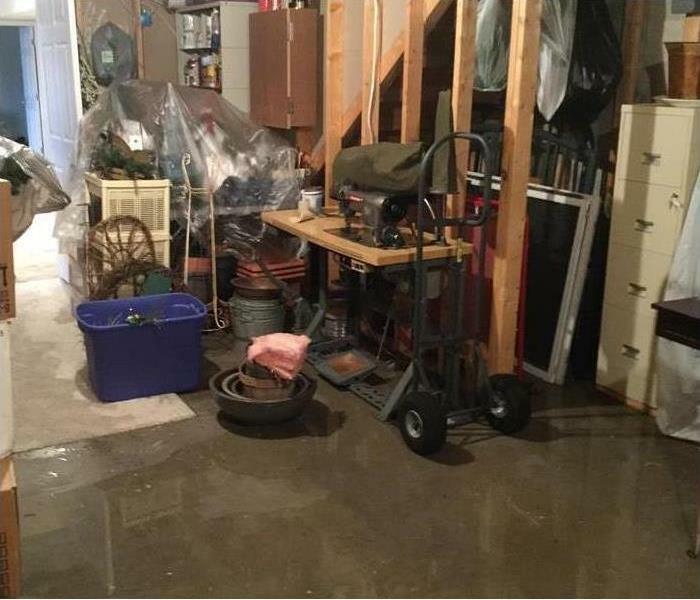 During a recent cold snap a cold water supply line under a kitchen sink caused this Southwest Missouri basement home to have a major flood. The dangers listed above can also enter your home during flooding. 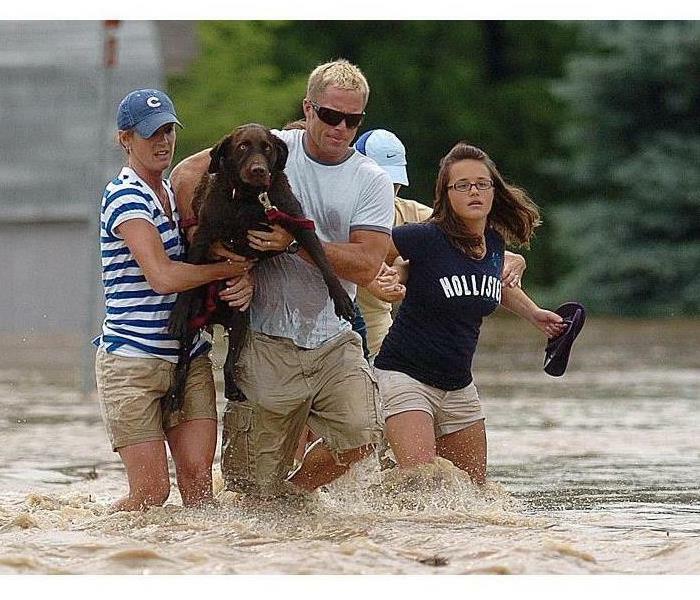 And even if the flooding comes from an inside source, some of these hazards still exist. 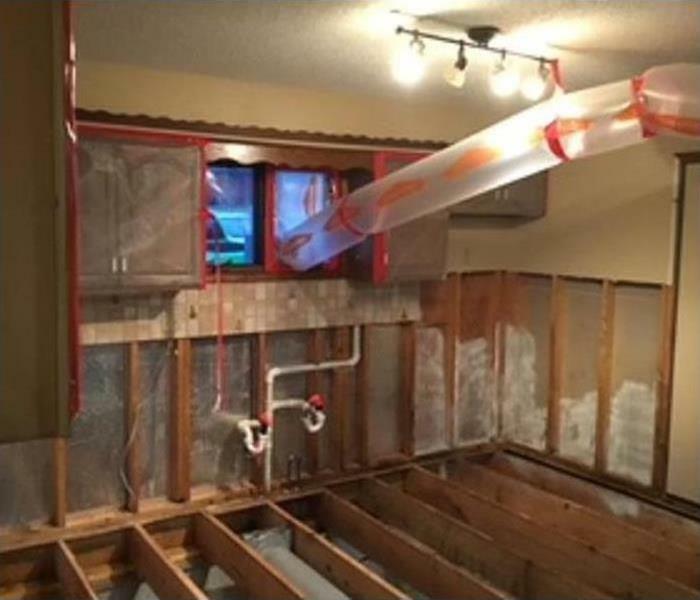 So instead of trying to handle such a catastrophe yourself, call the professionals at SERVPRO of Nixa / Branson who are trained for such emergencies. We use powerful pumps and truck-mounted vacuum units to quickly remove hundreds or thousands of gallons of water from your property. Then we’ll dry, dehumidify, clean, repair and return your property to normal. Does Your Branson Home Have A Mold Problem? 2/19/2019 - Does Your Branson Home Have A Mold Problem?